The Grit ensemble is now rehearsing the show. We’ve managed to stagger through the first third of the show, with most of the content in place. This is a bit of a brickwall moment. It’s where you realise that really you need about 2 years to actualise the vision, and you’ve got about 2 months. It’s where you realise that the scene we liked on paper doesn’t work in real life, and where you have to trust your performers to do what they do best: play, reinvent, play, experiment, play. The trouble is, playing takes times. The challenge of devising a musical is that it takes roughly 3 times longer than devising a straight show. The music is hungry. It wants minutes – it needs time to be developed and honed and made right. 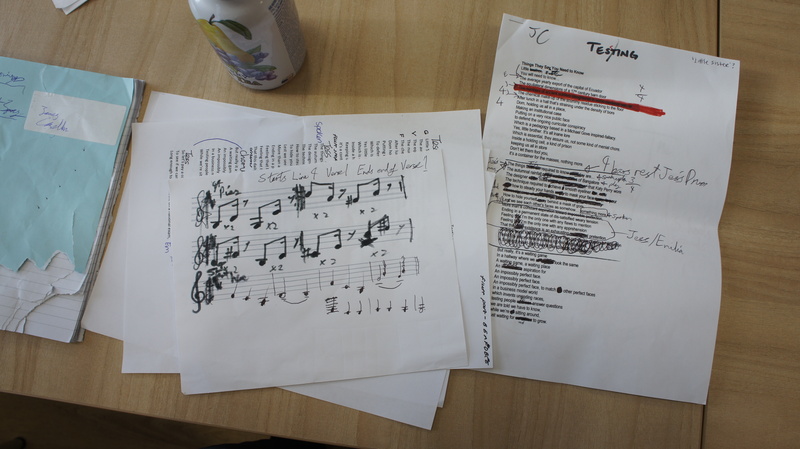 Over a 3 day intensive in August, we wrote quite a few songs as an ensemble. Jess and James and Emilia worked on two particularly challenging songs: Testing and Going Home. These tracks are challenging for different reasons. Testing is wordy. It’s beyond wordy – it’s kind of a rhetoric rant, in music-form. A sort of cerebral rap. So really, James and Jess and Emilia spent a whole day just trying to tame that song. To whittle the words into a shape that’s usable. And on the last day of our August intensive, they quickly bashed out Going Home, which is a perky, skippy, tongue-in-cheek, sarcastic song about a group of students going home from school. It’s half-mocking, half-fake, half-cheerful, half-sad. Alfie, Izzy and Taz wrote Grit, the title song – or as Meg calls it, an anthem. Meg and Taz finished it off on the last day of the intensive. Others of us worked on writing the second half the show – or at least laying a skeleton for the second half of the show. Luke and Hugh did some intensive dialogue writing. And Ryan, Ashley, Emily, Jade, and Gabby laid out plans for the 3 fantastical worlds that appear in the second half of the show. This visioning was epic too. Fantastic and weird and sci-fi and odd and quirky and perfect. And at the last minute, Taz finished up Seeing, which is a romantic duet. And Meg and I had one last tackle of the lyrics for Going Home, the duet version. Phew. It was a lot of intense work, and it was wickedly good fun too. And since the intensive, we’ve only had 3 rehearsal sessions. And we’re having a reality check… both about the amount of content in the show and also about the quality of the content in the show. These songs are epic and lavish. They want proper orchestration and proper harmonies and proper singing. They are going to take some serious rehearsal. We haven’t written simple songs here, and our rehearsal calendar is tight. We just need to figure out how we have time to play too. Because both things are important. So we’re going to use our Monday nights at the Acorn Centre to focus on this show. Most of our Monday night group is doing this show anyway, and it’s an opportunity to have a couple extra hours a week to sort out harmonies, or to play with the What-If puppets, or to polish the choreography of a dance number. It’s precious minutes and we need them. I’m excited for this upcoming Monday. We’re going to try to finish Testing enough to teach it to the company. And there have been a couple of exciting updates today. The glory moment of this process for me is when the song becomes right – when you realise you’ve found it. We had a first meeting with our technicians today… and that was good, to talk through the vision of the show and explore what’s tourable. And last night, at the end of our rehearsal, Elley and Sasha had a breakthrough moment with a problem song. And that’s magic. When you think something’s really not going to work, and then, suddenly… it does. Work better than you thought it would. So wish us luck. On a tiny budget, with a short rehearsal schedule, we’re going to try to pull of something epic. Something different. Something exceptional. Glad we have those Mondays.